Wisconsin News Connection is here..
MADISON, Wis. - Wisconsinites have long believed in funding and maintaining public lands and access to outdoor recreation areas. But the budget proposed by President Donald Trump slashes spending in these areas and essentially eliminates the Land and Water Conservation Fund. That fund is one the state relies on heavily to help maintain public lands and access to them. Land Tawney, president and CEO of Backcountry Hunters and Anglers, says the proposed Trump budget "cuts the fund off at the knees." "In a place like Wisconsin that does have public lands, it's always important to try to make sure that you have opportunities to provide more access to those public lands, and then also provide additional funding to protect the fish and wildlife habitat and the access that goes with that," Tawney stresses. The budget proposal reduces the fund by 90 percent. The massive hit to the Land and Water Conservation Fund under the proposed budget would be very much felt at the local level. Tawney says it would also mean a huge hit to recreational spending in America, which is a big contributor to the economy. "So if you think about any local park, really, across the nation, it's probably utilized the Land and Water Conservation Fund funding, and it gets people outside and then helps contribute again to the large economy - that's $887 billion every single year," he points out. Tawney says the Trump administration has its priorities wrong. "There's nothing more American than our public lands, and the Land and Water Conservation Fund helps provide opportunities for all Americans to enjoy these public lands that belong to all of us," he states. " 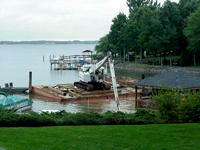 New small-scale dredging projects guidelines for the state's lakes, rivers and streams has been finalized. The DNR went to public comment about the general permit changes with more than 700 comments given by the public.